The authors in their article are devoted to describe the samples production of sophisticated eco-material PLA -PolyLacticAcid extruded horizontally in length, produced by FDM method, Rapid Prototyping. Carried out experimental tests of mechanical properties are presented by the authors in this article. 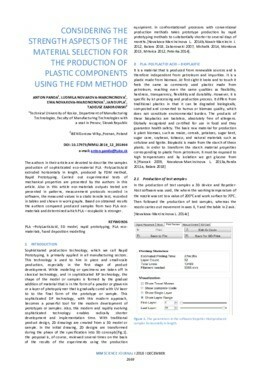 Also in this article eco-materials outputs tested are presented in patterns, measurement protocols recorded in software, the measured values in a static tensile test, recorded in tables and shown in work graphs. Based on obtained results the authors compared produced samples from two PLA eco-materials and determined which PLA – ecoplastic is stronger. "SUKHODUB LEONID, PANDA ANTON, DYADYURA KOSTIANTYN, PANDOVA IVETA, KRENICKY TIBOR"